Petrol lawnmowers are now becoming more popular with gardners as they become cheaper to purchase and easier to look after. Most modern petrol mowers use standard unleaded petrol straight from the pump, so no more mixing up fuel for 2 stroke engines. The main benefit is that a petrol mower can go anywhere - it is not tied to a power outlet, and it can also generally cope with longer grass due to the extra power. Petrol mowers are noisy compared to other types because of their air cooled engines, and do need a little more looking after to keep them running for years on end - however a well maintained good quality petrol mower will outlast most electric mowers. With self propelled models, electric start, and safety cut off switches there has never been a better time to consider a petrol lawnmower. There are 3 main types of Petrol lawnmower available, each offering different features and benefits. 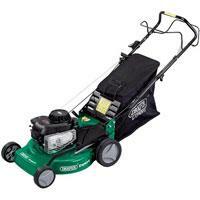 Petrol Rotary lawn mowers are the most popular type of petrol mower. They are generally the cheapest type of petrol lawnmower you will find. Any kind of rotary lawn mower cuts the grass by slashing at the grass with a rapidly rotating blade, that spins paralell with the ground. This type of cut is effective but not as fine as a cylinder cut for example. If you want your rotary mower to produce a striped finish, look out for a mower that is equipped with a rear roller. Petrol Rotary mowers are extremely good at coping with longer grass, due to the cutting action coupled with a motor that is generally more powerful than anything electric. Petrol cylinder mowers are the choice of the connoisseur or professional grounds keeper. They offer the very best finish due to their scissor like action, coupled with the range and felxibility that a petrol engine brings. Petrol Cylinder Mowers are more expensive than the rotary equivalent because of the precision required to manufacturer the blades and to assemble a machine with more parts. A petrol cylinder mower is what would be used to prepare bowling greens and cricket pitches so you have an idea of the quality of the cut. All cylinder mowers struggle more with longer grass than the equivalent rotary, as they may flatten the long grass a bit rather than cut it. What a petrol hover lawnmower also has is a fan (usually part of the same rotation mechanism as the blade) and a "skirt" which helps trap and direct a cushion of air to make the mower float. This makes a hover mower ideal for uneven surfaces, especially where there is banking. Petrol hover mowers are not as common as their electric counterparts so tend to be quite expensive. There are several types of starting mechanisms to be found on petrol lawnmowers. The type of start can greatly affect the cost - generally the easier it is to start the lawn mower the more expensive it may be. The common method for starting the engine on a petrol mower is the recoil start - this involves pulling a cord with a handle out fairly quickly to turn the engine over and get it started. Some people may struggle with this type of start if lack a bit of strength or have joint problems for example. There are petrol mower models with an electric push button start, which are obviously much easier to operate than a recoil. Some of the higher end models of petrol mower have an electric starter which is operated by a key - much like your car ignition. This has the added benefit of adding a layer of security as the mower can not be started without the key. There are 2 fuel types to choose from when buying a petrol engined mower - 2 stroke and 4 stroke. Most petrol mowers now run on normal unleaded fuel that you get at the petrol station and will likely be labelled as having a 4 stroke engines. 4 stroke engines do need oil, which is added seperately for the purpose of lubrication. Pay attention to the specifications when selecting a petrol mower because if you do select a 2 stroke engined mower you will need special additives for the fuel. In a two stroke engine, oil is usually injected by the engine into the fuel / air mix, or even added to the fuel itself before it is put into the mower. The added oil is burnt with the fuel, and accounts for the familiar smell associated with two stroke engines as well as the of blue-ish smoke that is produced. A 2 stroke engine is highly efficient and lightweight compared to a four stroke system, but they can be significantly noisier and smellier. A self propelled lawnmower directs some of the power from the engine is to drive the wheels, making it easier to push the mower. This is especially useful if the lawnmower is heavy. You still need to guide the mower of course. Models that are labelled as Autodrive are also self propelled. Lawn mowers that have a Blade Brake Clutch feature (BBC) allow the engine to be left running, whilst stopping the blade from rotating. A blade brake clutch is useful if you have to cross paths or leave the mower in one position for a little while as then you don't have to stop the engine and restart it again. The engine power will usually be quoted in horse power (hp or Bhp) and the higher the horse power the more powerful the engine. For a petrol powered lawn mower there will be a regular maintenance schedule to be followed. This will normally involve at the very least checking and changing the oil, and also spark plugs, which is actually fairly easy. As with all mowers they should have any grass or debris that is stuck to the blades or underside of the chassis cleaned off after every cut, especially if the grass is damp or wet. A brush can be used to do this safetly to keep fingers away from blades and to get into hard to reach places. Petrol mowers should be drained of fuel and then stored in as dry conditions as possible to avoid corrosion.